Born 101 years ago on this day in October, Thelonious Monk’s birthday is a great excuse to put a record or two of his on the turntable. My record of choice? Considering all of the high-profile, critically-successful albums Monk made during his time on Earth, this album may be a rather random choice to spotlight for his birthday. This album was Monk’s 6th studio album for Columbia, released in 1967. However, to borrow critic Scott Yanow’s phrase, there may be few surprises here but it’s a solid album just the same. Or as Orrin Keepnews wrote in the liner notes to the album, “one does not look for new ground to be broken every time Picasso paints”. It’s a good album from a great jazz artist, and at the end of the day, isn’t that exactly what you want anyway? For an album released in 1967, the recording information is surprisingly incomplete. Numerous Googles couldn’t turn up a specific recording date or a location (although I assume it was at Columbia’s studios in New York City). The personnel aren’t listed on the album, and the notes only mention Thelonious and his saxophonist Charlie Rouse- quirks that befit Thelonious Monk. Monk is in good form, stretching out and using his classic chords and phrasing on his solos and comping perfectly behind Rouse’s sax or Gales’ bass. In fact, listening to this album again after a few months of being on the shelf, I came to the realization that Monk was actually a great accompanist- Miles Davis’ gripes aside. 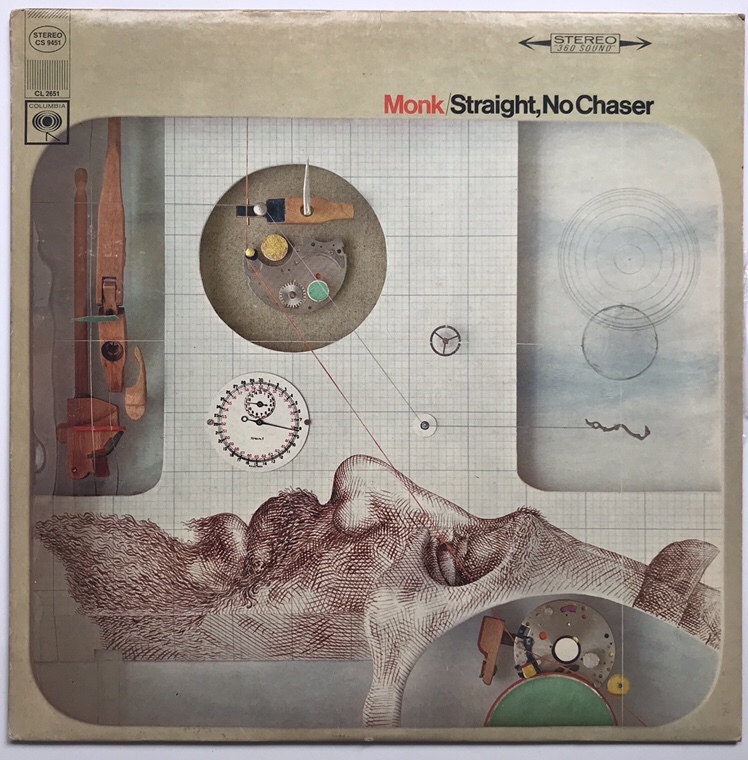 A great example of Monk’s excellent and tasteful comping is his work behind Rouse on the album’s title track “Straight, No Chaser”, a blues Monk wrote back in the 1940’s. He starts off playing very Monkish figures behind Rouse with no chords as a sort of counter-melody. He then moves to a more typical comping style but retaining his unique chord voicings. With each chorus, he leaves more and more space while keeping the music moving with his syncopated chordal punctuation. Finally, he lays out and lets Rouse stretch out with the bass and drums, effectively moving the spotlight firmly onto the sax. Rouse plays a solid solo, full of interesting twists and turns, before deftly handing it to Monk. Monk’s solo is the main reason why I chose to spotlight this tune. Aside from his wonderfully percussive piano solo, hearing him “sing” his piano lines is highly amusing to me. 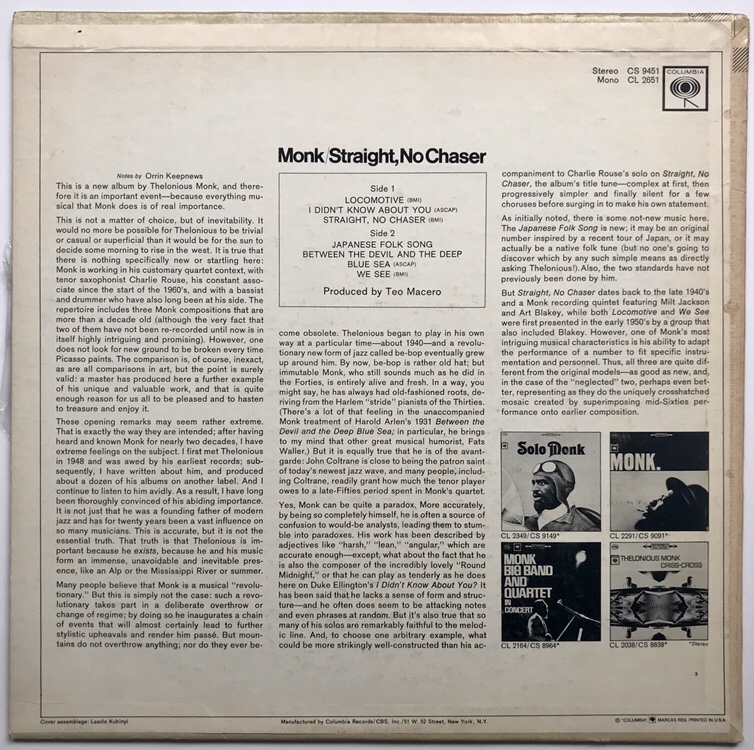 People frequently lob words like “wild”, “disjointed”, and “abrupt” to describe Monk’s piano style, but to my ears, Monk was also rather structured. No matter how far-out he got, he almost seemed to follow the basic formula of playing a lot, moving to chords, then playing less and with more space, until he was just silent. I can dig it. The rest of the album features a few more Monk originals, and Ellington tune, and a jazz standard. The original album’s material was edited down to fit onto the record, and was later restored on later reissues on CD. “Japanese Folk Song”, originally over 16 minutes, was drastically edited and condensed for the original release. Teo Macero, Columbia’s jazz producer, was known for his editing and splicing, but his work on this album is rather seamless and unnoticeable. Great job, Teo! If only he could be so lucky on all of his edits. It’s 1967, and the movement of slapping modern art on album covers was in full swing. Pun intended. Jazz albums seemed to suffer the most from this attempt to make records more ‘hip’ or ‘modern’ through artsy covers. Sometimes, it worked. Often-times, it didn’t. Case en point, this album cover. What on earth is going on here? Obviously, that’s supposed to be Thelonious down there, but I don’t understand what the other things are supposed to mean. Is he in gear to play? Is this representative of his mind working in tandem with the world? I have no idea, but it’s kinda odd. Of course, this could just be Columbia’s way of playing up the persona of Monk as an odd character, in which case I’d revise my rating to an F.
Columbia made an interesting choice in having Orrin Keepnews write the liner notes for the album. Why? Mr. Keepnews was the one-time head of Riverside Records, a record company that had signed Thelonious Monk. Monk and Riverside split on less than amicable terms due to disagreements over money, and Monk opted to sign with Columbia. Riverside Records subsequently went out of business in the early 1960’s. So to have the “enemy” write your notes is certainly eyebrow-raising. The notes themselves are pretty informative, aside from his omission of the sidemen. Usually, Columbia is the tops when it comes to sound but occasionally even Columbia’s engineers were capable of an off day. While the fidelity is great and life-like, the mixes and stereo sound stage used is questionable. For some reason the engineers thought it would be cool to have the bass and sax far to the right, the drummer by himself in the left channel, and Monk right in the middle, with almost nothing permeating throughout. It makes for a rather right-heavy listening experience. Rouse’s sax is mixed quieter than the bass and barely louder than the piano, causing him to get somewhat lost in the mix. In the more recent CD and streaming reissues, the music was remastered so that Rouse’s sax comes through louder, correcting the odd mastering of the original tapes. Acoustics aside, the vinyl plays relatively quietly. The vinyl is non-deep groove and has Columbia’s classic 2-eye labels in white from the late 1960’s. I’ve noticed that some labels are deeper red than others, and I’d like to know if there’s some reasoning behind that. More study is needed! Right before I moved from California to Alabama, my grandpa let me raid his record collection and take whatever I wanted. Lucky for me, he was a serious long-time jazz fan (he played checkers with Dizzy Gillespie and Max Roach in the 1950’s in Los Angeles!!!). Buried among his Lou Rawls and Henry Mancini albums were records by Oscar Peterson, Dave Brubeck, Miles Davis, and Thelonious Monk, among others! Before he could change his mind, I grabbed as many as I could. This record was one of the albums I was lucky enough to find. After buying vintage jazz albums in stores or online, it’s pretty awesome to obtain records directly from the original owner. Knowing my grandpa walked into a record store in 1967, looked at this record, and decided to take it home with him makes this a special record. Luckily he kept pretty good care of his albums!